Hair is a major part of a woman's identity. Whether we choose to straighten it, curl it, dye it or rock it au naturel, feeling good about our hair can take our confidence level from zero to 10 with a single brush stroke. It's no wonder so many of us spend tons of money on shampoos, conditioners and other products to keep our hair game on fleek. But it turns out, maintaining a flawless mane is less about what we're putting on our heads and more about what we're putting in our bodies. Just like our skin and nails, our hair is affected by the foods we eat. "Both are a barometer of how well (or how poorly) you're feeding the body," dermatologist Jessica Wu, M.D., author of Feed Your Face and skin and beauty expert for Daily Glow, told Huffington Post. So if celebs like Jennifer Aniston, Priyanka Chopra or Tracee Ellis Ross are giving you major hair envy, fill your plate with these foods to get the thick, shiny, healthy hair you've always wanted. Delicious on anything from salads to tacos, avocados are chock full of nutrients that are essential for hair health. "Avocados are rich in healthy fatty acids, vitamins and antioxidants that can improve your hair from the inside (root to tip)," Rochelle Graham, CEO of the natural hair product line, Alikay Naturals, told me an interview. "The nutrients in avocado, including vitamin E, can help stimulate hair growth as well as prevent hair loss." 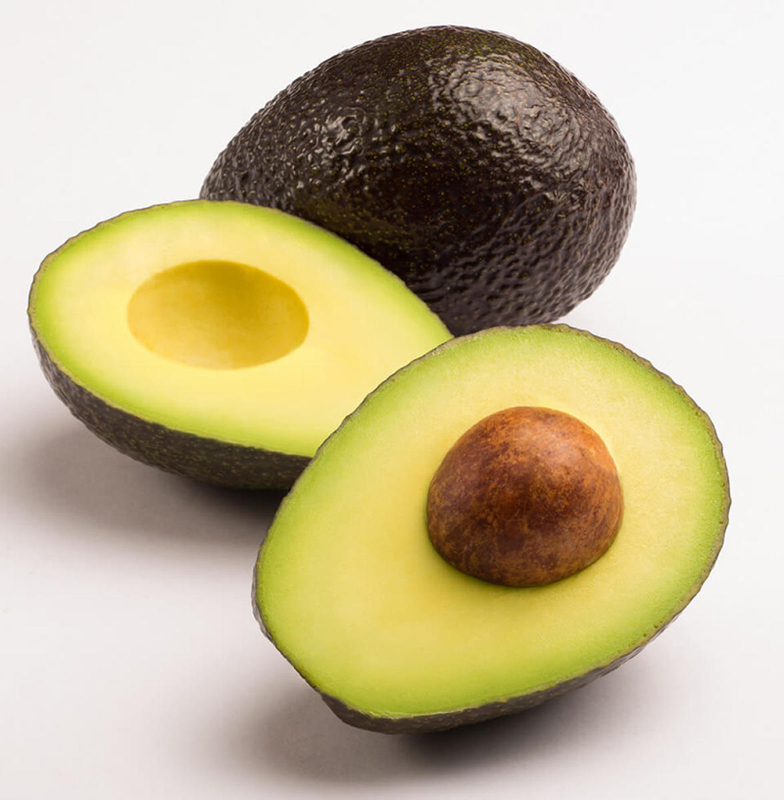 What's more, avocados are source of monounsaturated fat, which is a healthy fat that can help lower bad cholesterol when consumed in moderation. Avocados also get bonus points for being vegan-friendly. Coconut water lovers, rejoice. There's a new reason to continue your love affair with this sweet, refreshing beverage. "Coconuts have vitamin B, vitamin C, and vitamin E," says Graham. They also have a high amount of a fatty acid known as lauric acid, which Graham explains helps to promote hair growth. Eating coconuts may also be beneficial to your waistline. 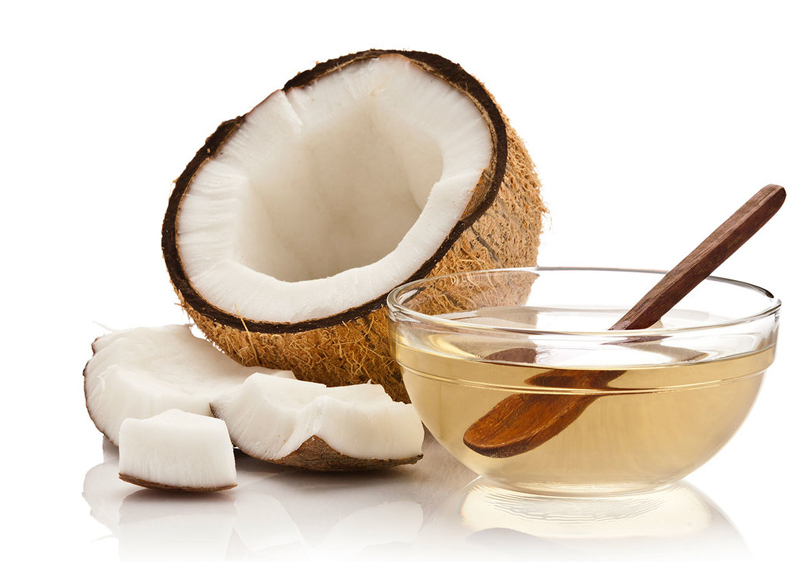 According to Authority Nutrition, coconut oil may be effective in reducing hunger and revving up the metabolism, which can promote weight loss. I love me some ahi tuna, so I was excited when Alexandra Caspero, MA, RD, a nationally-recognized nutritionist and member of the HUM Nutrition team, explained that eating fatty fish on the regular could be good for my hair. "Salmon, sardines, and mackerel are packed with healthy omega-3 fatty acids, essential fats that we must get from food," she told me. "Not only are they helpful for reducing risk of heart disease, they also keep hair shiny and full." 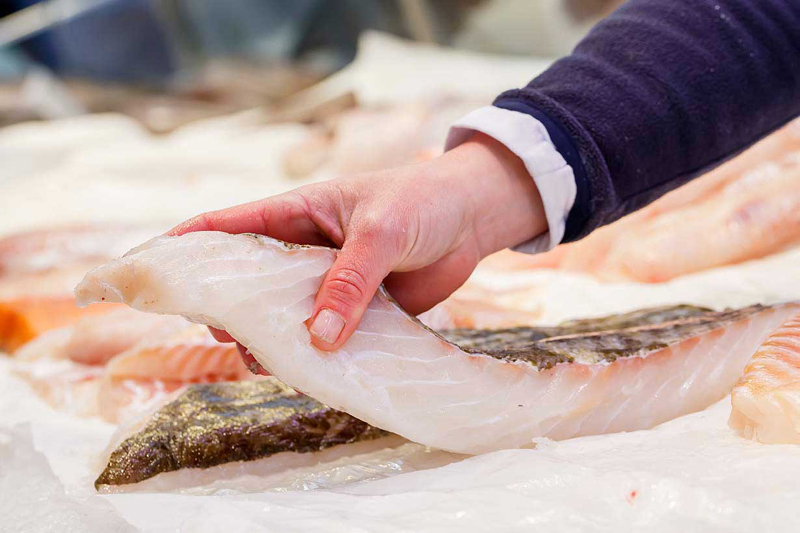 Rima Kleiner, MS, RD of Dish on Fish, is also a fan of fatty fish, particularly salmon. "Salmon is an excellent source of nutrients that promotes healthy hair," she said. "The omega-3s can help hydrate your hair follicles for growth, and the protein and biotin can help strengthen your strands and prevent breakage." Chia seeds have been steadily gaining popularity in the health industry, with many experts dubbing them a superfood. Chock full of protein, potassium, calcium, fiber, zinc and other essential nutrients, chia seeds have numerous health benefits — including helping you develop lustrous skin and nails. 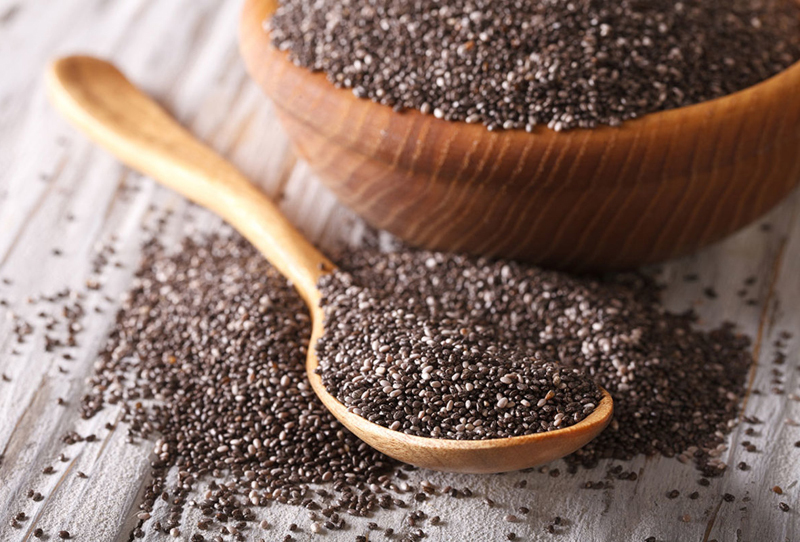 "Similar to fatty fish, chia seeds are a (plant-based) source of omega-3 fatty acids, an essential nutrient for healthy, shiny hair," says Kleiner. For an easy way to get more chia in your life, Kleiner suggests adding them to smoothies and oatmeal. 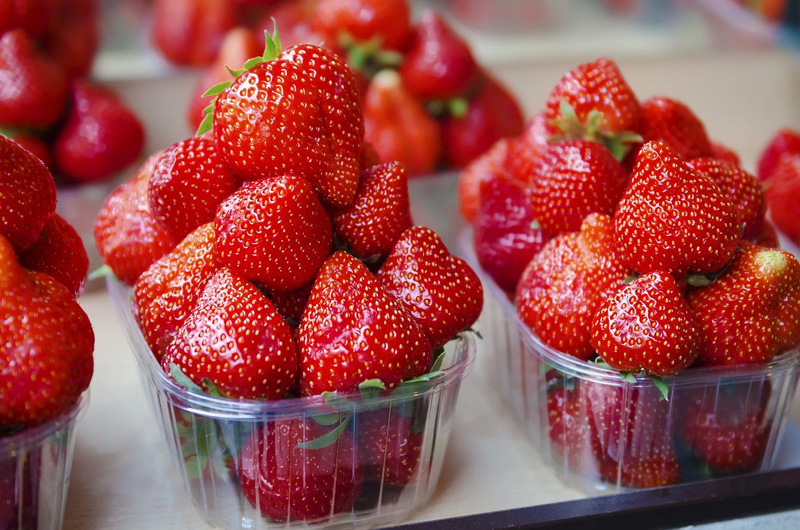 A cup of strawberries contains a whopping 84.7 milligrams of vitamin C (that's more than an orange), which can fight off colds, improve heart health and help you reach your hair goals all at the same time. "Strong hair starts at the roots, with a healthy supply of blood vessels that nourish the follicles, making hair strong and able to withstand heat damage (blow drying, curling, etc. )," explains Kleiner. "Since vitamin C is an important part of collagen production, needed in structuring blood vessels, make sure you are getting enough." Other vitamin C rich foods to keep on your radar: "Citrus foods are a great source as are tropical fruits and bell peppers," Kleiner notes. 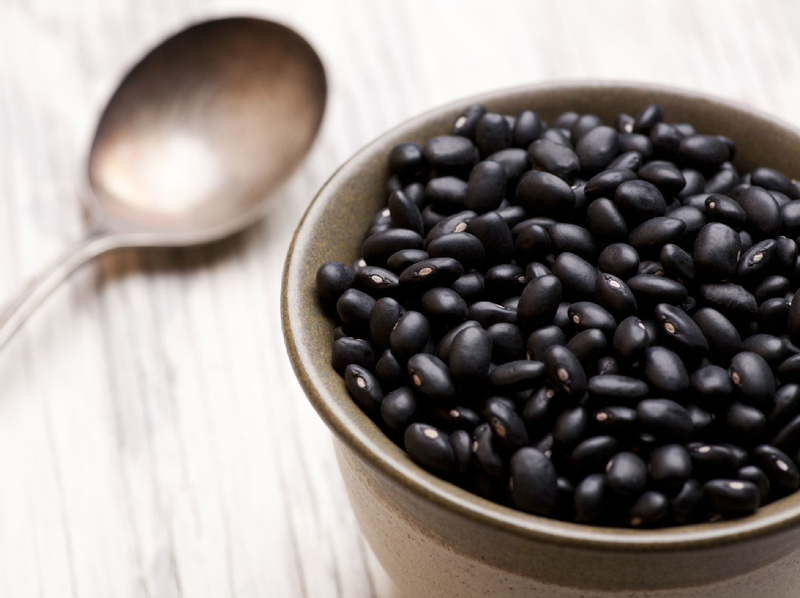 Inexpensive and high in fiber, black beans are a great source of plant-based protein that can have major health benefits for our hearts, bones, digestive systems and hair. "High in protein and iron, black beans are a beneficial food for strong hair," said Kleiner. "Protein is needed to build, strengthen and repair keratin, a key component in the structure of hair and nails." If you want healthier hair, ditch the pancakes when you go out for breakfast and order eggs instead. 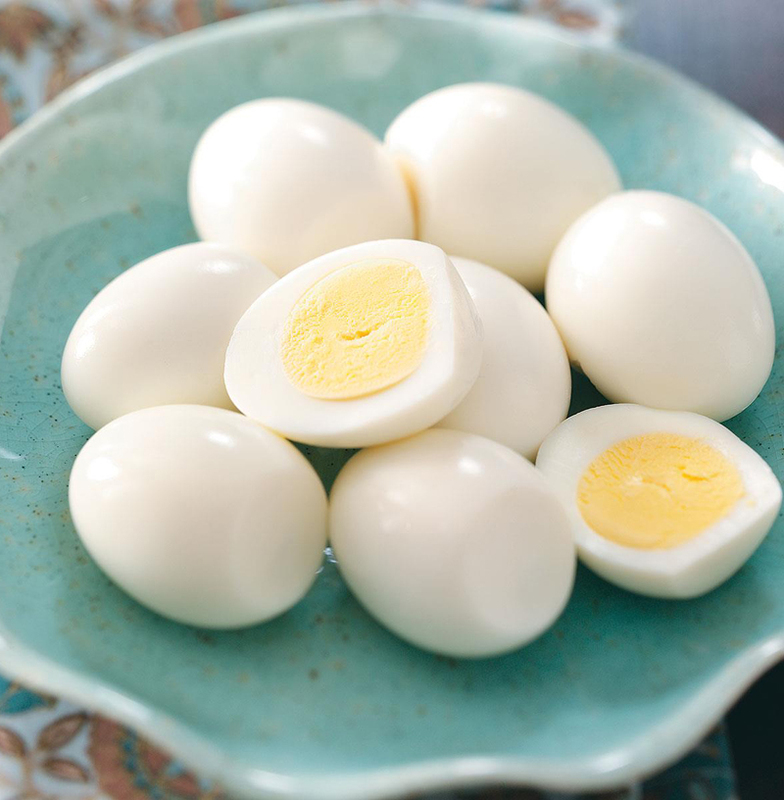 "One of the few food sources of biotin, eggs also contain protein," notes Kleiner. 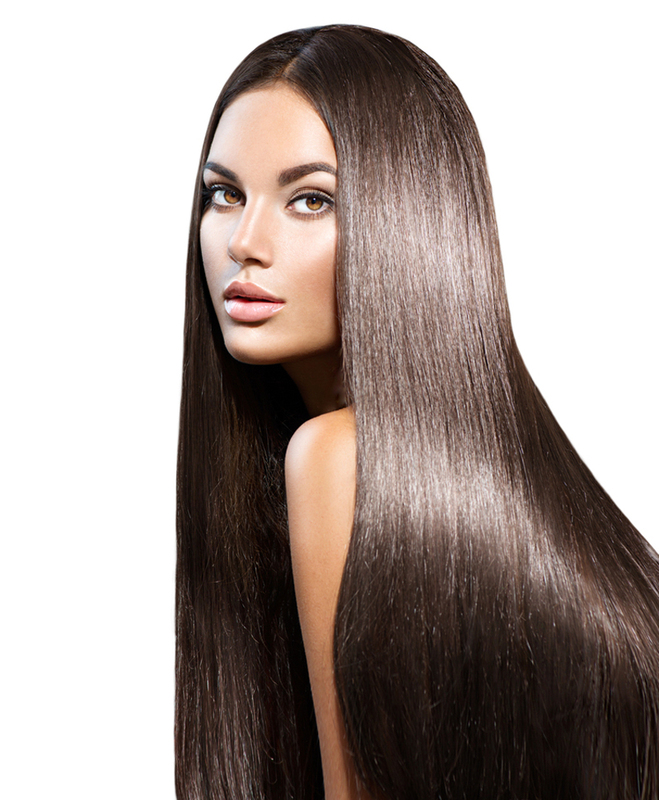 "Biotin is an essential nutrient in the development and growth of strong hair." She adds, "Since the yolk contains most of the nutrients in eggs, forgo the egg white omelet and go for whole eggs instead." From carrot juice to soup, carrots are a hair BFF, according to FitHair Expert and wellness guru, Alexandria Williams. "They're an excellent source of vitamin A, which assist in scalp health," she explained to me via email. "Carrots also play a role in sebum production, which directly helps hair growth," she added. 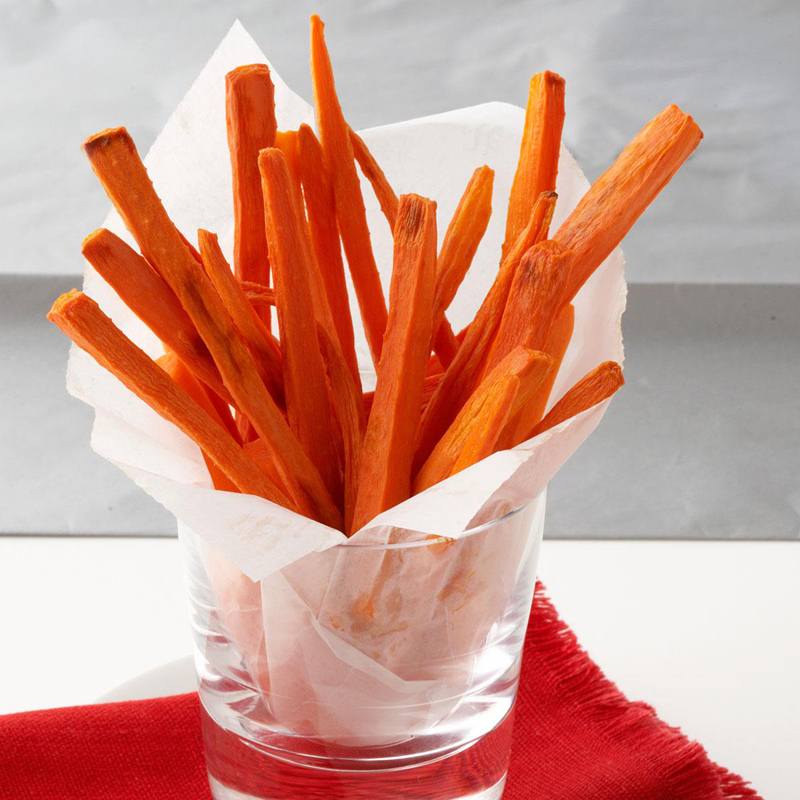 So while you probably don't want to go too crazy chowing down on the carrot cake, you could swap your midday bag of chips from the office vending machine for some carrot sticks, instead. Your hair, and your waistline, will thank you. A hot bowl of broth is one of my favorite meals during colder, winter months. It's also one of Williams' favorite items for healthy hair. 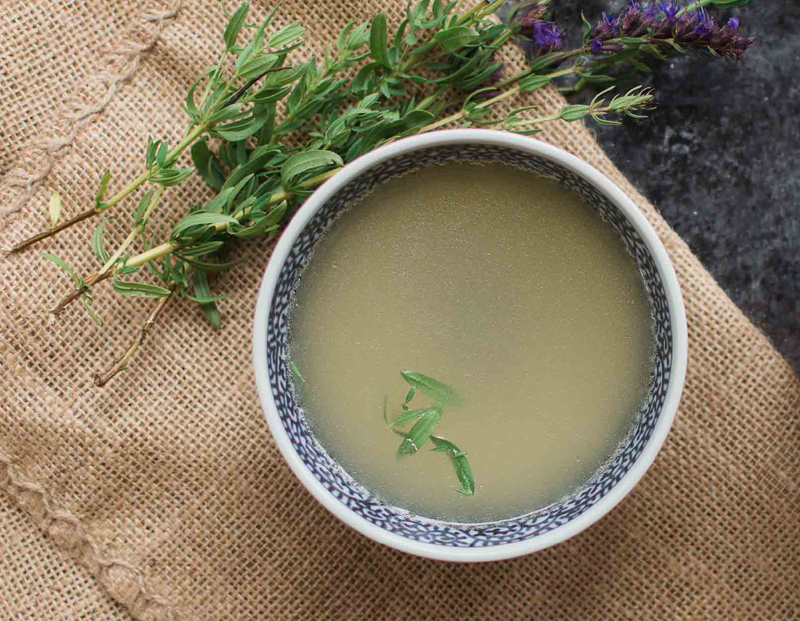 "Bone broths are typically simmered for a much longer period than regular stock," she said. "They also contain at least 10 grams of protein per serving, and a significant amount of collagen and minerals, which directly help with healthy hair." Now that we know what foods to load up on, are there any that could be sabotaging our healthy hair goals? "There aren't specific foods that may damage hair directly," HUM nutritionist Caspero told me. "But having a diet that's unbalanced in essential nutrients won't help with trying to achieve beautiful hair. As most of these nutrients are typically found in nutrient-dense foods (vegetables, fruits, lean protein), a diet that's heavy in processed foods may not see the same results." Therefore, she recommends increasing fruit and vegetable intake to 4-5 times per day, and adding in more nutrient-rich foods, for ultimate results. Supplements are another great way to ensure nutrition, says Caspero. "It can be difficult to get in the recommended nutrients per day to assist with healthy, strong, shiny hair. For my clients with these beauty goals, I often recommend a supplement to help cover their needs. My current favorite is HUM's Hair Sweet Hair, a vegan gummy that's packed with biotin, zinc, PABA (helps maintain hair color), folic acid (supports cell growth) and fo-ti (a root used in Chinese medicine for healthy hair). It contains all of the recommended nutrients for healthy hair and is simple to enjoy in gummy form." Wellness guru Williams is also a fan of supplements, saying, "Multivitamins are a great way to cover the necessary vitamins you might be missing. My favorites are Garden of Life My Kind line as they are plant-based, Non-GMO, organic and both gluten and soy free." When you can eat your way to healthy locks from the inside out, who needs a whole arsenal of hair products?